KADUNA Chambers of Commerce, Industry, Mines and Agriculture (KADCCIMA) over the weekend hinted that more than 4.5 million Nigerians have rendered jobless between 2015 and 2016. The chamber also added that, about 2.6 million were added to unemployment figures of 1.46 million recorded in the ‎third quarter of 2015 and 518,102 in the fourth quarter of 2015 while unprecedented number of companies have collapsed while several others are in comatose. 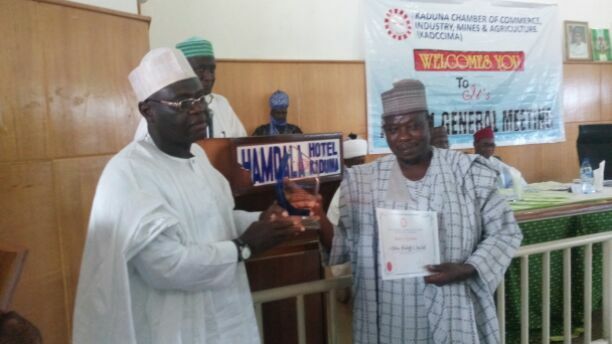 The immediate past President of KADCCIMA, Dr Abdul-Alimi Bello‎ stated this in an address at the weekend on the occasion of the combined 41st and 42nd Annual General Meeting (AGM) and presentation of award of excellence to organizations and individuals who have contributed immensely to the organization. Dr Bello further stated that, “during the reference period, the unemployment in the labour market increased by 1,158,700 persons resulting in an increase in the national unemployment rate to 13.3 percent in second quarter of 2016 from 12.1 percent in 2015, 10.4 percent in 2015 from 9.9 percent in third quarter 2015 and from. 8.2 percent in 2015. “The value of capital imported into Nigeria in the second quarter of 2016 was estimated. At. $647.1 million which represents a fall of 75.73 percent relative to the second quarter in 2015. This provisional figure would. Be the lowest level of capital imported into economy on record and would also represent the largest year on year decrease. “During the period under review, there have been unprecedented job losses in most sectors of the economy. A challenging period from the oil sectors where companies have recorded inability to service debts and have embarked on mass retrenchment to the manufacturing sector where companies have embarked on job termination to reduce non business critical costs to banking where institutions have terminated the employment of over 5,000 workers this year alone in a bid to optimize operations. As a way forward, he suggested that the federal government must ensure that there is timely and transparent allocation of allocation of forex to manufacturers‎ to import spare parts and raw materials for production activities. “Ensure effective patronage of locally manufactured goods as well as domestic service providers in all ramifications. “Ensure prompt payment for goods and services supplied to all MDAs‎ so as to speed up the deflation process in the economy and ensure active promotion of PPP‎ for the envisaged infrastructure development by federal and state government”, he stated. The chamber however at the end of the meeting have new set of excos to champion its affairs for the next four years with Dr. Muheeba H. Dankaka as the President Dr. Aliyu Dikko is now 1st Deputy President. Others are Alhaji Suleiman Aliyu, 2nd Deputy President. while council members are Hon. Ishaya Idi, Hajiya Rakiya Musa, Dr. Segun Falope, Alh.Tijjani Musa, Dr. David Obiora, Alh. Lawal Umar Mayere, Alh. Farouk Sulieman, Hajiya Fati Usman, Engr. Sunday G. Mshelia, Alh. Shehu M. Shitu, Mal. Gimba H. Ibrahim, Aliyu Mamman.